The vice president of the student council of Shuchiin Academy, member of the Shinomiya Zaibatsu and the daughter of the Shinomiya group, she is a multi-talented genius who can do anything if she sets her mind to it. Due to the way she was raised in the Shinomiya Family, she instinctively looks down on other people and thinks of ways to use them for her own benefit. 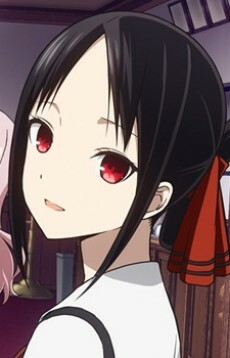 Kaguya rarely interacted with other people before she joined the student council, but that has begun to change. She is an incredibly sheltered girl, resulting in her lacking in several pieces of what might be considered common sense. She still doesn’t understand love very well, and her main objective is to make Miyuki Shirogane fall in love and confess to her.